But concern trolling over the fidelity of the Olympics’ roster of sports overlooks just how capricious the traditional selection process has been. The 2016 games in Rio already feature a record 42 sport disciplines — rugby and golf are the newcomers this year — that make up more than 300 events. Both rugby and golf were part of the the 1900 Olympics in Paris — the second modern summer games — but by 1908 golf was out and rugby followed shortly thereafter. Other sports like basketball and boxing were added in subsequent years, but by the 1988 games in Seoul, South Korea, far more obscure sports like synchronized swimming, taekwondo and rhythmic gymnastics were on the Olympic docket, decades before golf and rugby would return. Each Olympic cycle the executive board of the International Olympic Committee votes to add sports that have petitioned to be included based on criteria like “TV ratings, ticket sales, anti-doping policy and global participation and popularity,” according to ESPN. This can be an unscientific thing, as was made clear in 2013, when the board voted to drop wrestling from the 2020 Olympics and then reversed that decision and reinstated it just a few months later. 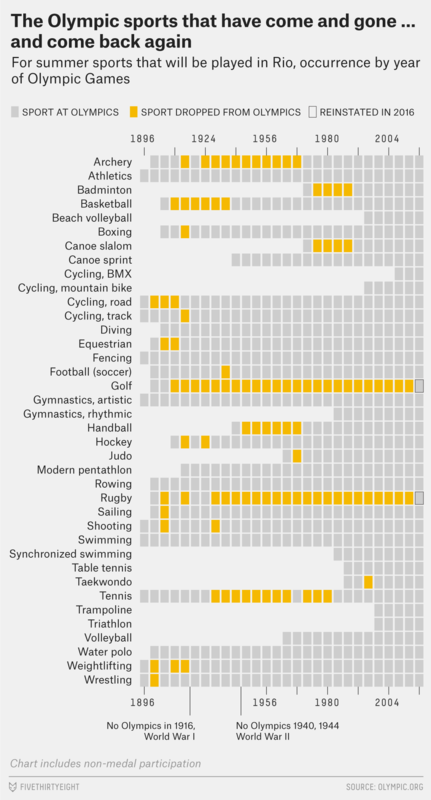 CLARIFICATION (Aug. 4, 5:33 p.m.): The chart in this post shows only sports included in the 2016 Olympic Games, not those that will be added in 2020 or those that were played in previous games but discontinued. We used the categories of sports based on the results from the 2012 London Olympics, and included golf and rugby for 2016. A few categories of sports changed in 2012, however. Individual equestrian events are now all listed under “Equestrian” and individual wrestling events (Freestyle vs. Greco-Roman) are also now both listed under “Wrestling.” We removed two sports that debuted at the summer Olympics, ice hockey and figure skating, but are now winter sports.